Beautifully written and precise in its engagements with the literature of the colonial and post-colonial condition, Natalie Melas's All the Difference in the World: Postcoloniality and the Ends of Comparison is a brilliant study of the idea of comparison and a exploration of the possibilities of comparative literature in the world that confronts us today and tomorrow. 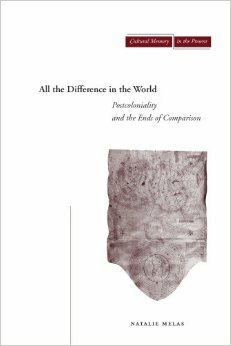 Rethinking the enterprise of comparative literature itself, All the Difference in the World examines examples of postcolonial comparison by focusing on forms of "incommensurability"-comparisons in which there exists a basis for comparison but no standard of equivalence. In this compelling study, she performs close, carefully wrought analyses of texts by Joseph Conrad, Derek Walcott, Aimé Césaire, and Simone Schwarz-Bart, accentuating moments of temporal, spatial, gender-based, political, and economic slippage, dissimilation, and disproportionality and thereby complicating and enriching our understanding of postcolonialism. Melas elucidates her readings through theoretical writings of Jean-Luc Nancy, Edouard Glissant, especially in her juxtaposition of these cultural theorists to our ongoing discussion about the nature and focus of our disciplinary concerns in the field of comparative literature.